You want the best lawn on the block—a healthy, beautiful property you’re proud to own and feel good about when you pull into the driveway after a long day. Maybe you’ve hired a pro and haven’t gotten the results you expected. Or, perhaps you’ve been handling lawn care yourself. In either case, achieving the results you desire is taking more time than you want to spend. The lawn you have today could be better, so you want to hire the right professional. You’re making a big decision that will not only improve the appearance and health of your lawn, but also free up more of your time so you can focus on other priorities. You might feel like you can’t control how your lawn looks today, but you can control who you partner with to get the results you want. Whether you’ve been burned in the past or are making a choice like this for the first time, you want to make the best choice. 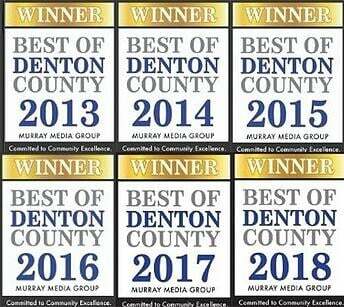 There are a number of local lawn care services in Denton and Collin counties, TX. How do you choose the best provider? 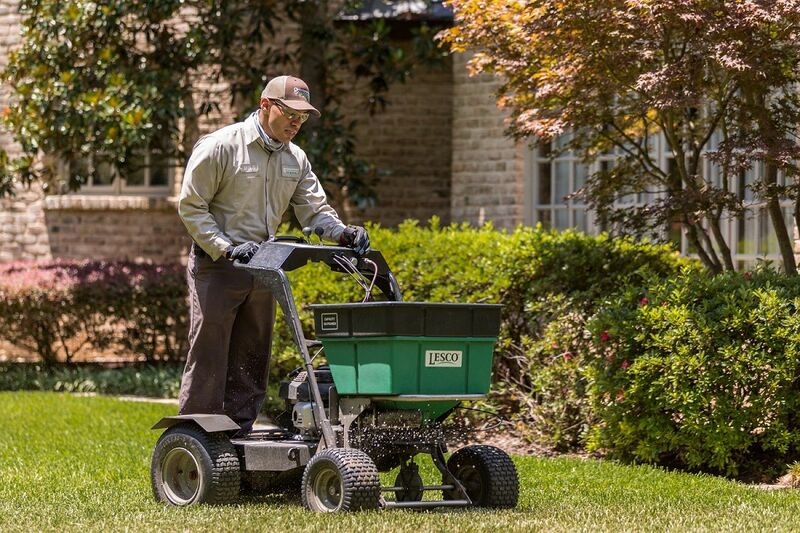 We know that selecting a lawn care professional can feel stressful because there is a lot of information online, and you’ve probably heard neighbors or friends in the community talk about local lawn care companies like Gecko Green Lawn Care and Grassperson. How do you determine which local lawn care company will deliver what you expect? The key is to do some research, and we want to help you with this process. Here is a candid comparison of two local lawn care companies that serve the Lewisville, Flower Mound, and Highland Village, TX area. I’m Jack Moore, owner of Grassperson, and I’d like to help you understand what qualities to look for in a lawn care company so you can make the best decision for your property. I know it might seem surprising that I’m interested in sharing information about a competitor, but we believe the most satisfied customers understand what services they are purchasing and how those services will be delivered. We’re very open about what our customers can expect, and we make a real effort to educate the community about the benefits of professional lawn care. 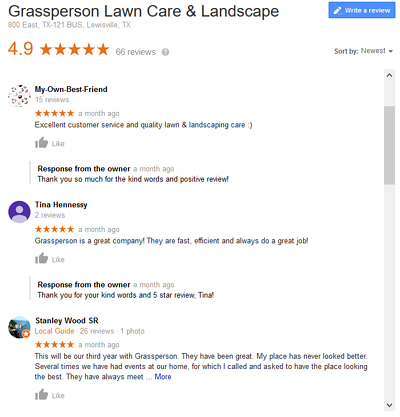 That’s why I’m taking the time here to organize key information and facts you should know about Gecko Green Lawn Care and Grassperson so you can get to know them both and make the best choice for you. 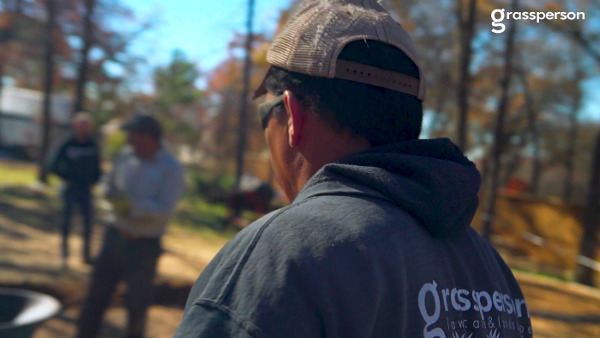 You’re trying to figure out which lawn care company to hire, and at the end of the day, you’re really investing in the people who will deliver the service on your property. Find out what qualifications employees have, and learn what training and career development opportunities the company provides. At Grassperson, we take pride in being a family-owned business—and employees are all treated like family. We were founded by Brian Gasperson, who is well-respected in the community. My wife Ann, and I took over ownership in 2018 and we are carrying on the people-first values. You’ll see what we mean if you check out our culture blog, where we highlight employees and share their stories. We want customers and anyone considering Grassperson to get to know the committed people who service their properties. We hire team members who want more than a job. Our veteran employees mentor new staff, we provide in-field and training at industry conferences, and we talk about career paths with our team members. 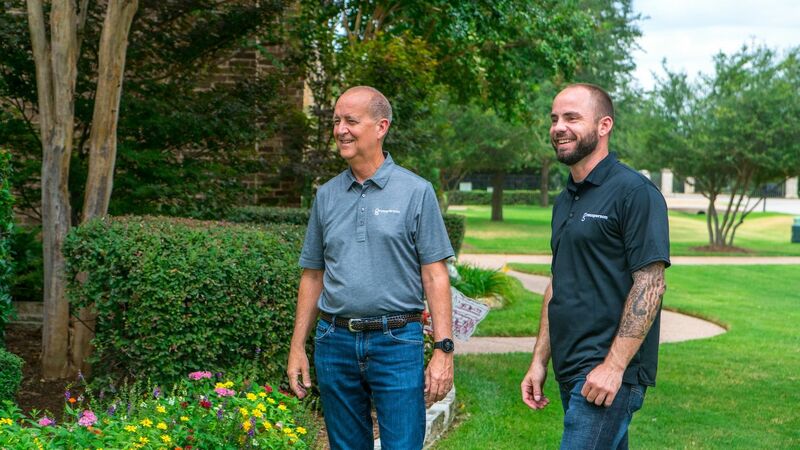 The result is a team that takes ownership over their work and treats clients’ properties with the same care they would give to their own lawns. Gecko Green Lawn Care also boasts a family environment on its website, and you’ll read that the company has been in business for about the same amount of time as Grassperson. However, the Gecko Green website does not highlight employees’ experiences or share how the company offers careers so it may take some work to uncover these details. People are the most important aspect of a service business like lawn care because you are entrusting your lawn to a team. Their skills, abilities, and commitment to quality are what will give you the results you want. Check out companies’ “help wanted” or careers pages to see what type of people they hire, what skills they look for, and what benefits they give to their people. Another hint: A company that talks about careers could be willing to invest in training and development, so you’re likely to have a true professional caring for your lawn. You’ve narrowed your lawn care provider search down to these two locally owned, family-focused businesses. You feel good about the people behind the operations. There are some differences, but now what you really need to know is what services they deliver. How will they will give you the results you want? Let’s dig in and compare Gecko Green Lawn Care’s service offerings with what Grassperson provides its customers. You’ll get lawn fertilization, pre- and post-emergent weed control, fungus and disease prevention, and lawn aeration and grub control as additional services. Gecko Green Lawn Care offers a 9-visit lawn care program that includes insect control. Beyond its lawn care program, Gecko Green Lawn Care also provides tree & shrub care and mosquito control. However, if you’re looking for a provider that can also handle landscaping tasks like mowing and edging, maintaining irrigation, or planting annuals, you’ll have to hire another pro to do this work. Gecko Green Lawn Care does not offer those services. 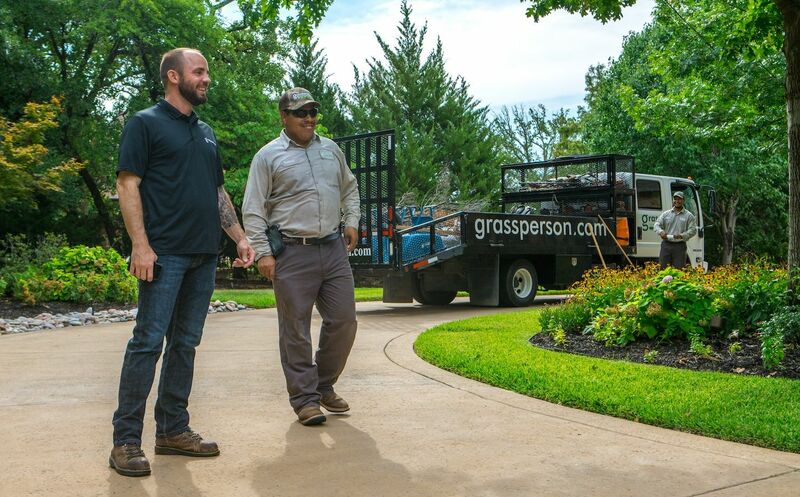 Grassperson offers the same lawn care services as Gecko Green: fertilization, pre- and post-emergent weed control, disease prevention, and optional lawn aeration and grub control. Grassperson’s lawn care program includes seven visits, but you are getting the same treatments and same time spent on the property as Gecko Green delivers in nine visits. 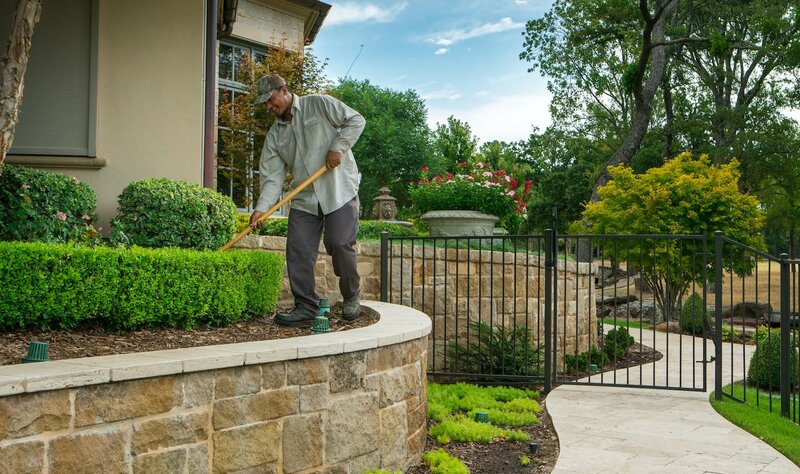 Additionally, you can choose landscape maintenance services like mowing and edging, and landscape installation including planting annuals and mulching. 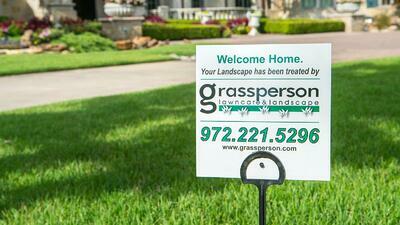 Grassperson has a certified irrigation technician and dedication irrigation division. Are you looking for a professional to deliver lawn care services, or would you like the option of also having your lawn mowed and landscaping needs taken care of without hiring another company to do that work? The benefit of a full-service lawn care and landscaping company is the simplicity of dealing with a single provider you trust. Online ratings are widely available, and we know many people look at these ratings to decide which service providers to hire. Beyond the overall Facebook and Google reviews and ratings, take some time to read reviewers’ comments and how the companies respond to those. It can tell a lot about how the lawn care company delivers service and takes care of its customers. Are there reviews from long-time customers? This is a sign that they are seeing results from the service. On the other hand, an abundance of negative reviews can be telling. Every company will inevitably get a bad review here and there. No one is perfect. However, focus on how the company replies to those poor reviews. Are they attempting to remedy issues? Another way to gauge quality is by the awards companies win. For example, Gecko Green Lawn Care boasts an A+ rating from the Better Business Bureau (BBB) and has an Angie’s Super Service award. However, we are not sure how old these awards are. As for the BBB awards, keep in mind that sometimes BBB will not rate a business because they do not have sufficient information or they are reviewing a business’s file. 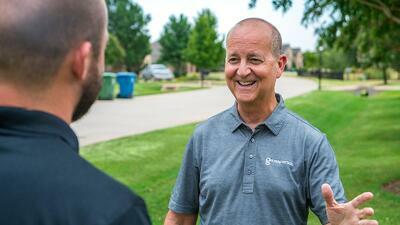 Grasssperson has earned lots of local recognition as a six-time winner of The Best of Denton County. 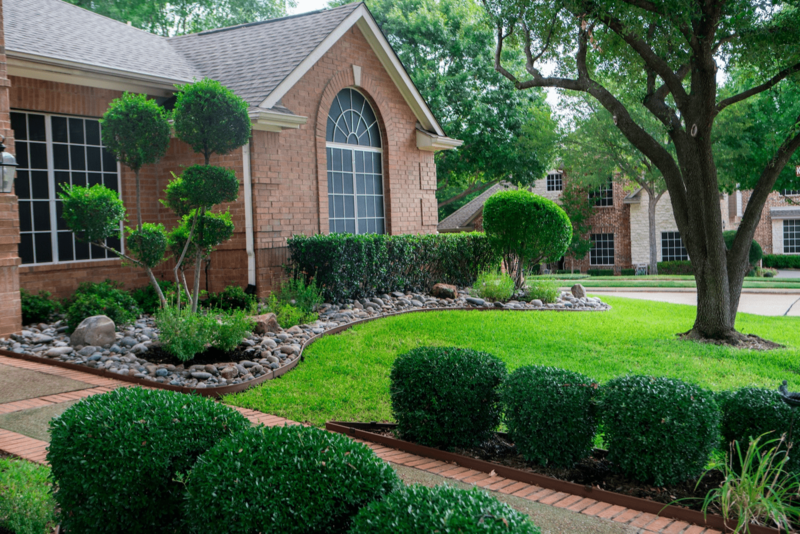 If you’re comparing Gecko Green Lawn Care or Grassperson, you’re already interested in hiring a local lawn care company to service your north Texas property. And, there are many benefits to hiring a locally owned and operated business. Their owners and employees live, work and play in the same neighborhoods you do. So, they tend to be committed to making sure you’re really satisfied with the service. Be sure that you are comfortable with the area your lawn care company specializes in. Find out which specific areas it services. When companies stretch themselves too thin, they might not be as responsive. Gecko Green Lawn Care covers a larger service area of 4 counties. Grassperson focuses on a portion of two counties. Locally owned businesses tend to be more invested in the community and your satisfaction. There’s a good chance you’ll run into the owner at the grocery store or a Little League game. But, does the company really “get” your needs? Check out companies’ blogs. Do they write about solving problems you can identify with, such as managing crabgrass or getting rid of the most common Texas weeds? A local company that also understands the issues you face will be more likely to solve your lawn care problems effectively and deliver the service you deserve. You’re an educated consumer who is taking time to do plenty of homework before hiring a lawn care company. We hope these facts will help you compare Gecko Green Lawn Care and Grassperson so you can make the best decision for your lawn. Both companies offer lawn care, but it appears Gecko Green recommends two more yearly visits than Grassperson does. While Gecko Green only specializes in lawn care, Grassperson also provides total landscape maintenance so you only have to hire one company. Both companies have good reviews, but you’ll notice that Grassperson tends to earn slightly higher ratings. The companies are locally-owned and operated and boast a family environment, but when you dig deeper you can find out more about the training and careers they offer. At the end of the day, you are hiring a lawn care company to make your life less stressful. If you hire the right company, you won’t have to worry about your lawn and you’ll get the results you expect. Not to mention, if you partner with a full-service provider you can save some time going through this vetting process again to hire a landscape maintenance company. Everyone’s looking for something different, which is why getting the facts is so important. 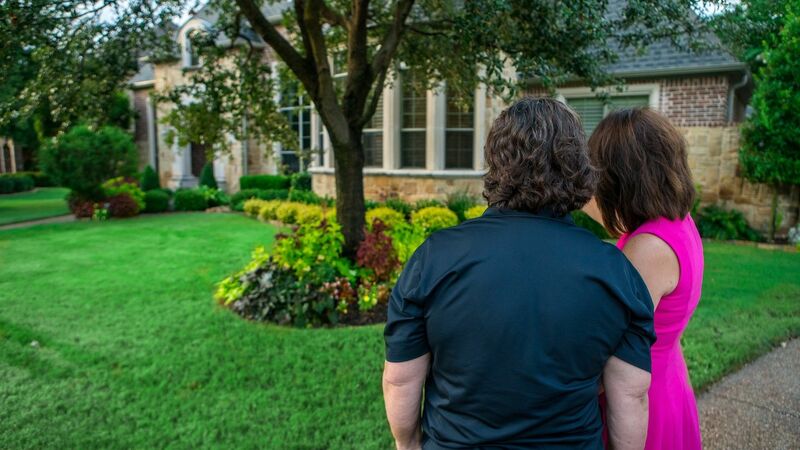 Then, you can confidently choose a company to take care of your north Texas lawn. We want you to have the best lawn on the block. We’d be honored if you joined the 2,000+ Grassperson clients that decided our company was a great option. But, if Gecko Green Lawn Care is your choice, we wish you the best. What matters to us is that you make the decision with confidence, and we hope this fair comparison helps. Seriously, get the lawn you deserve. Now that you have honest details to compare two local lawn care companies, you can stop doing all the work and hire a professional you trust. Get a free quote and $25 off your first visit, then enjoy the best lawn possible.